In 1949, Tajikistan was hit by a devastating earthquake that killed more than 20,000 people. Twenty-eight years later, Brian Tucker, who had just finished his Ph.D. in seismology, found himself in Tajikistan as part of an exchange program between the Soviet Union and the U.S. Geological Survey. In a small town in the mountains, Tucker met a man whose childhood home had been the only building to withstand the earthquake. The man's father had constructed the house in a nontraditional ways with thick timbers in the corners. "The irony is that here we were standing in the only building in the whole village that stood up under the earthquake and I asked the man: 'So, if you build a new house how will you build it? And the man answered, 'Oh, in the traditional way. My dad was a real kook,'" Tucker says. Nankhel, Nepal. Villagers look on as a shaker table tosses around scale models of local buildings. The model on the right represents a building using traditional construction techniques; the one on the left is the same building except with a couple simple additions to mitigate earthquake risk. The building on the right is just beginning to collapse, and collapses totally several minutes later, driving home the importance of improved construction strategies in the earthquake-prone village. Photo by Laura Dwelley-Samant. It was on this trip that Tucker realized that simple changes in building design can dramatically reduce the risk of deaths and injuries from earthquakes in developing countries; but also that many people had not taken those steps. The realization planted the seed for a nonprofit that Tucker founded 14 years later. The John D. and Catherine T. MacArthur Foundation announced on Sept. 25 that Tucker is one of 24 people to receive what is often called the "Genius Grant," $500,000 with no strings attached to pursue his interests. 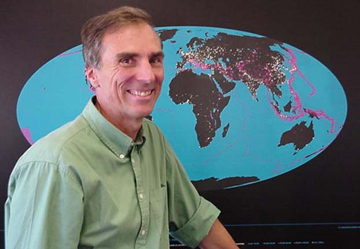 Given as part of the MacArthur Fellows Program, the award recognizes past creativity, which Tucker demonstrated when he founded GeoHazards International (GHI) in 1991 - the first nonprofit, nongovernmental organization dedicated to mitigating earthquake risks in the world's poorest and most vulnerable regions. "Brian is not afraid to follow his gut instinct. He didn't know when he started [GHI] where it was going to go. He knew he wanted to work on the problem and just dove in and started working. It was a risky and daring approach," says Laura Samant, project director at GHI. GHI has retrofitted schools in Ecuador and Nepal, built a hazard assessment organization in Nepal, and is currently working on similar projects in India. Four of five deaths caused by earthquakes in the last centruy occurred in developing countries. But the low frequency of the events makes the threat invisible to many people. "We work with people on the other side of the world, often on a hazard that they do not know about," Tucker says. So making people aware of the seriousness of the risk is critical. 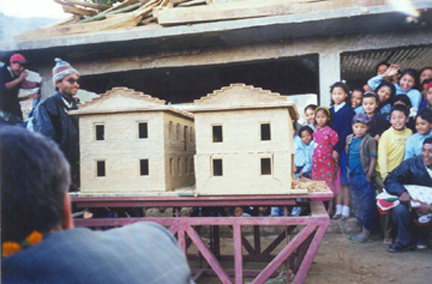 For example, in the town of Nankhel in the Katmandu Valley, Nepal, GHI workers built two 1:10 scale models of an important building in the town. One model represented the building as it is today. The other represented the same building except with a couple simple engineering additions to make the building more secure. A crowd of townspeople watched as a shaker table tossed the models around, simulating an earthquake. The revamped building stood, while the other fell apart, driving home both the risks of earthquakes and the importance of well-engineered buildings. In Nepal, the organization has strengthened nine schools to resist earthquake damage. Most schools in Nepal are built of brick and cannot withstand much tension force. When an earthquake hits, the base of the building shakes in all directions and tension forces bring the walls down. Town masons and engineers from the GHI office worked together to retrofit the schools by wrapping bands of reinforced concrete around the outsides of the buildings to hold the walls together during an earthquake. The walls move in unison, and thus experience less of the devastating tension force. Funding for GHI comes primarily from philanthropy. When Tucker began thinking about forming the nonprofit, he went to some good friends in Japan who worked for the geotechnical company Oyo. "They shared the vision that engineering skills developed in the U.S., Japan and Europe should be applied to reduce risks in developing countries," Tucker says. Through a combination of personal and corporate donations, the Japanese partners came up with the startup money for the non-profit. The goal was for the organization to become self-sufficient, and they are "pretty much there," Tucker says. Brian Tucker stands in front of a map indicating earthquake hot zones throughout the world. Photo by Janifer Stackhouse. Tucker served as principal and supervising geologist at the California Division of Mines and Geology, the State's Geological Survey, for nine years before founding GHI. Tucker enjoyed his job applying science to public policy in California. Yet, he says: "it was clear to me that the real need was in developing countries. There were so many experts working on seismology problems in California." Tucker does not yet have specific plans for the money from the MacArthur award. But he says the part of the award he values most is not the money; rather, it is the recognition of the work he and his colleagues do at GHI. "When I got the call - the MacArthur Foundation validating and recognizing our work - it was just the greatest thing I could imagine." Two other earth scientists were awarded the MacArthur Fellowship this year. Lee Ann Newsom is a paleoethnobotanist at the Pennsylvania State University. She analyzes fossilized plant and wood remains to look back at how prehistoric populations used their natural resources. Paul Wennberg is an atmospheric chemist at the California Institute of Technology. He has developed sensitive, airborne sensors that help clarify the factors governing ozone depletion.